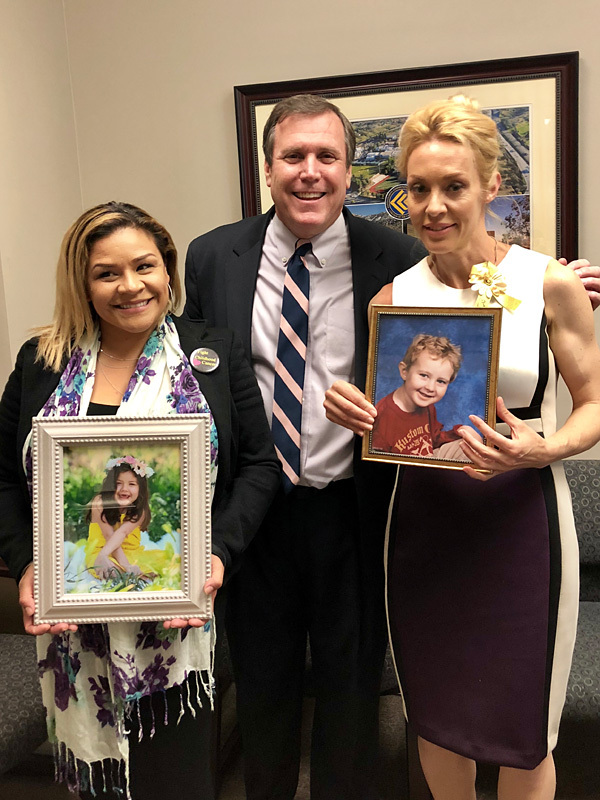 Pictured in the photo are Janet Demeter of Agua Dulce (with a photo of her son Jack), Senator Wilk, Joana Sandoval of Hawthorne (with a photo of her daughter Katelyn Kin). Both women lost their children to DIPG. Sacramento – Today the California Senate unanimously approved Senate Resolution 106 (SR 106), a measure by Senator Scott Wilk, R-Antelope Valley declaring May 17, 2018 as Diffuse Intrinsic Pontine Glioma (DIPG) Day. DIPG is a malignant brain tumor that affects the brain stem. It is almost exclusively a pediatric disease with most children being diagnosed between the ages of five and nine. There is no one cure or therapy to effectively treat children with DIPG. Janet Demeter, who lost her three-year-old son Jack to DIPG was in Sacramento to support this resolution. Janet is the founder of Jack’s Angels Foundation, a nonprofit corporation named after her son that has taken the lead in promoting research for this type of cancer. The Foundation established the DIPG Research Fund at the Children’s Hospital Los Angeles (CHLA) in 2013. Children’s Hospital Los Angeles conducts research and clinical trials to help shed light on the nature of DIPG and to find potential treatments that provide greater hope for survival.